Computer is sort of acting up so haven't been real active but though i'd give it a go. This is more of a modern take and possibly more of an American slant as don't see to much European talk about it. 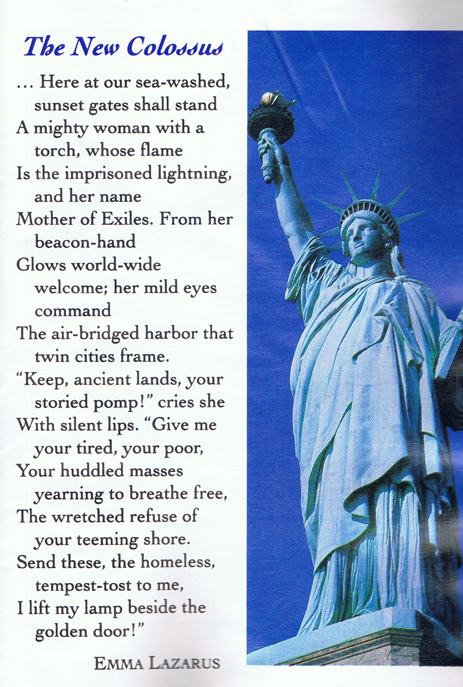 Most people are familiar with our Statue of Liberty that sits in New York Harbor. It's greeted people for many years now and has been tied to immigration and Ellis Island ever since it was presented to the US by France. While today most people only recognize the lady in her blue-green color hue I imagine most have forgotten or never realize that she was actually a copper / bronze color. Historically modeled after the Roman goddess Libertas which is where she gets the name Liberty. Additionally, most do not realize that the final product which stands in New York harbor is not the same as what was initially done in France as there were modifications. However that is not the end of the story for many who claim that she is actually the goddess Hekate. That claim being made by both devotee's of the goddess and by other's who acknowledge it for less than ideal reasons. Some basing the claim upon the idea of Hekate's three fold union of goddess of Land (Ellis Island), Sea (New York Harbor) and Air (it's location and rising sun). SOme also basing it upon her more chthonic role as a liminal goddess with Ellis Island being a liminal spot between the old world / old life and the new world / new lives for so many people. That and the idea of restless dead being lead and drawn to or by her, yet the idea of dead never truly being dead having to be fully an idea of a corpse but one dead to one life yet not established in another life but in the in between space and restless and ungrounded. 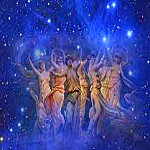 It also loosely touched upon the idea of Hekate's role in leading Persephone into the land of the living after her time in the underworld as the sun rises into the light and holding her torch (es) to guide the way and meet the dawn of the rising sun which will be Demeter's approach as Persephone climbs from the darkness (ie the ship approaching from the Atlantic). Actually statuary wise the Statue of Liberty form wise mostly matches one known image of an Hekate statue, that being Hekate Chiaramont with its radiating ring of spikes that look like sun beams. Though the exact count is different between the two statues. Of course this would not be complete without adding the Free Masons into the discussions. Very loosely the idea is the statue ties back to Isis and was a gift from the Free Masons of France to the Free Masons of the US. Was supposed to be used for the opening of the Suez Canal but since that failed in 1867 (?) it was then sent to the US in 1884. All part of the larger Free Mason movement and world plan. All in all an interesting theory but does it actually tie to Hekate? It has parts that can clearly be modified to fit her story and functions. But then again I read an article that said the Statue of Liberty could also be Attis the Phrygian sun god who castrated himself and is now considered transgendered by the LGBTQ community. This one gets sort of iffy. The original models used for concept art were Egyptian women. But the artist was focused upon the end of the US Rev. War and the end of the US Civil War which it is believed also reflected back upon the French Rev. So while Slavery is touched upon it is not specifically connected to slavery as a specific issue. From what I gather there may have even been a small cast done of an African looking form early on based upon one of the Egyptian inspired drawings. But not sure how many drawings or prototype castings were actually done before the final form was decided upon. The idea of the images in Iraq seems to make more sense to me as a source of inspiration to be honest. Thanks for that link. Though I'd start a discussion on this aspect of Hekate, Hekate Phosphorus, ie The Shinning One, Light Bringer, Day bringer, Morning Star, etc. Quite a few potential meanings though basically I think one has to look to the term "Phosphorus" itself as Morning star or Venus, specifically the planet. When it comes to the Hellenes and probably to the later Roman connection with goddesses it seems to be connected to the idea of a torch. With Demeter, Diana and Artemis it is usually in the form of a singular torch that is held. Of course there are exceptions to that rule, such as when Demeter & Diana are seen with two torches on Roman coins. Artemis though is normally seen with a single torch, even when conflated with Bendis. Yet the variety of torch can be either the short shaft torch that resembles what might be called a normal hand held torch or the long shafted torch that could be more like a spear. However, Hekate is always seen with two torches, and they always seem to be the long shafted torches in most instances. Torches that become very apparent in the story of Persephone and Demeter and her return to the upper world. A role in which she acts as companion and guide, moving from the darkness of the shadows and into the light of day. Somewhat acting as guide but also revealing the pathway and perhaps as navigator in the sense of revealing the pathway they are taking. That role of navigator, guide and transition from darkness into light or light into darkness matching up to her role as Phosphorus. People today want to make it more spiritual and astral / etheral but that really removes it from it's more mundane and physical presence. Phosphorus, the Morning Star or Vensus, the star by which navigators charted upon the oceans. One of the brightest spots in the heavens and used to tell where one was and reveal where they were going as they came from the darkness or pass into the darkness. Like Persephone, it marked the year and either rose into the morning as the brightest light before the sun, or was the brightest light after the sun before it passed into the void of night. It truly was the Shinning one, The Day Bringer, the Light Bringer, the Morning Star. Then like Hekate in her role as guide, companion and Mistress of liminal time and places it marked her presence in both the Heavens and presence upon the Seas. To some degree it also denoted the passage from the upper world and into the lower world of Persephone as it transitioned across the heavens. If the Morning Star was on the low Horizon then Hekate was in the Heavens or celestial. If the Star was in the night sky then one might surmise that Hekate was in the Under World or perhaps Chthonic. But UPG here on my part, Hekate has two torches. That and she held dominion over three realms at the same time, Heaven, Earth and Ocean. So in that sense unlike Persephone who is bound to the underworld for 1/3 of the year Hekate is not even though she is a companion to Persephone. Holding dominion she is still aware of all three and acts in all three though she might physically be in any place. Her torches light both points, dawn to dusk and dusk to dawn if one keeps the idea of stars. Being she is somewhat the Morning Star but also the Evening Star in that capacity as guide and influence upon showing the way as one passes into the dark or into the light from liminal time. Today I see many in the occult community speak of Phosphorus but I think they miss the mark personally. It applied to a specific time and function, mostly the gray time around dawn and specifically as a guide and navigation. That point when shadows still held sway in most spots and the light of day had not penetrated and humanity was still fairly blinded but needed a bright spot to guide them. Yet it's in the morning which I think symbolically applies more to youth or birthing than the normal course of our lives. Yet as the evening star she returns again as a bright spot but that is as the point were we start more to pass into the world of the dead and preparations for it and the underworld. Not to say that is all Hekate does through out our lives but the Phosphorus aspect of being the morning star and setting the light at the start of day. Of course one can be "Born" potentially many times as the course of their lives changes and they discover their life course has changed and a new dawn opens before them. Rubygirl wrote: If Hecate is a Titan, she pre-dates mankind. So she technically wouldn’t be of any country, people in countries only claim dieties when it suits them and The Ancient Greeks and Romans were still pretty patriarchal, being a female, it probably took centuries for her cult to catch on. But with that said, why don’t we just ask Hecate? lol, when identity politics inserts probablies' cause patriarchy. Pleiades wrote: Thats a fair opinion of that particular current though Chumbley,whom I had met and entered into personal correspondence with has held more respect among academics than those who copied him.A scholar himself he drew upon a myriad of ideas from many sources including the artwork of Aubrey Beardsley.In fact it was the artwork itself that was the key to understanding his Azoetia though his overview of it I received at an age at which I could not realistically comprehend it. Yes, I forgot about Beardsley! I find Chumbly fascinating; though, I haven't done enough work to really see Azoetia in a way that would make it relevant to my life. I also encountered it before I was ready for it. Chumbly, Spare, Crowley, and even Grant were great in their own ways (maybe Grant was greatest for promoting the work of Spare). People who source them tend to be either very responsible scholars of occult lineages and aesthetic currents or opportunists. Chumbley also contributed some useful articles to.among others,the old Cauldron magazine run by the late Michael Howard,They turn up sometines on auction sites at a price much more reasonable nowadays.If you find any,look out for the issue containing his work on Initiation transmission methods.Looking at your blog,I think you would find that of worth.Sadly I no longer have a copy-if I did or come across it again I would send it to you. I think he touched on Hekate but my information on this was that he had obtained information from an unreliable source and later wrote it off.It seems the same source provided information he used in Qutub which was published before he could write it out.Whatever Staley found of Kabbalistic worth in that work,Chumbley had confided in Howard(also a member of Cultus Sabbati)regrets it was out there. Anyway,off topic so back to Hekate. True and there would have been a lot more excellent ones if Mike had not been so biased in his selecting. Pleiades wrote: Chumbley also contributed some useful articles to.among others,the old Cauldron magazine run by the late Michael Howard,They turn up sometines on auction sites at a price much more reasonable nowadays.If you find any,look out for the issue containing his work on Initiation transmission methods.Looking at your blog,I think you would find that of worth.Sadly I no longer have a copy-if I did or come across it again I would send it to you. If you still have the poems would love to read them if you don't mind sharing them here. I have all sorts of knowledge of Hekate and stuff but ironically she's never inspired me to write poems about her. Actually started to a few times and get this voice in my head that basically says "Don't even try!" Always took that as a sign she wanted me to speak about her but not write stories or poems in praise of her. Yours would be a familiar story.Ironically toward the end Mike included rubbish from people who had long been avoided by the more serious members of the community.Scraping the barrel was I thonk the phrase floating around to describe that. Like Monsnoleedra says,you should post the poems here if you have time.